TITANIUM COOKWARE IS A TRULY NON STICK COOKWARE, WITHOUT THE CHEMICALS FOUND IN TEFLON. We use Titanium to create a cooking surface that is 10x more non stick than Teflon, more durable, and without PFOA. In this video we show you just how amazing Titanium Cookware is. Watch us cook eggs with no oil! Titanium Cookware might not be for everyone. That’s why we have created a pdf guide on 7 Things You Need To Know BEFORE You Buy. WHY COOKWARE MADE FROM TITANIUM? Titanium is the lightest and toughest metal known to man, and the same metal used on spacecrafts, airplanes and golf clubs. It is so safe for humans that it is the material used for the surgical replacement of knees and hips. 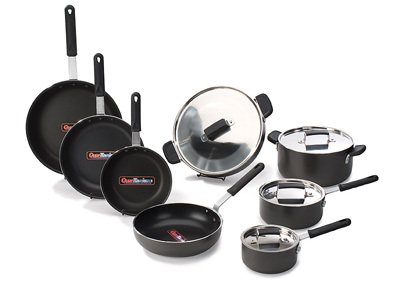 You can bake, braise, broil, sear, poach, brown or blacken in any of these titanium pans, WITH NO OIL! However, you can use oil if you wish, it’s your choice. Every Titanium pan is Certified by the NSF, The National Sanitation Foundation. This makes it certified for commercial use. The metal handles are all tri-riveted. Nothing is screwed on or spot welded so they won’t break off or come loose. The rivets are also embedded with the oil-free, titanium surface. 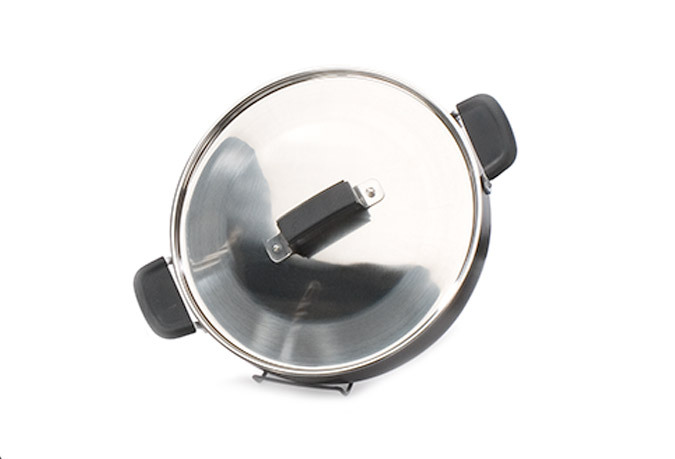 All of the lids are heavy duty stainless steel and have an adjustable steam vent built right in. Each lid is recessed about a half inch, creating a reservoir for any liquid that may boil over and preventing messy spillovers. Titanium Cookware has all the advantages. TITANIUM COOKWARE IS A TRULY NON STICK COOKWARE THAT LASTS, WITHOUT THE CHEMICALS FOUND IN TEFLON. How frustrating is it when your food sticks to your pan? Especially if it is a pan that is supposed to be non-stick? For me, it made me angry. Like, really angry! Not to mention, I had a ton of anxiety over the fact that I didn’t know what my non stick pan was doing to me and my family. What if my partner forgets and uses metal utensils? Will the non stick coating come off and poison us? Will we get cancer? It was so frustrating! Things are different now. Today, I’m able to sleep at night knowing that my family is eating food that is not exposed to harmful chemicals. Plus, I’m simply happy. I’m happy because I can cook literally anything, and the cleanup takes 10 seconds. No sticking, ever. It just doesn’t happen. Sounds incredible right? Maybe too good to be true? Well, it’s not. It’s 2016 and in today’s world of new and emerging technology, this has become a reality in the kitchen. Hi, my name is Dan and I run the web operations here. At the time, I was living in Chicago and barely making it on time to work every morning. Chicago traffic was insane! So having time to cook breakfast in the morning was a challenge if I didn’t have a clean pan! Sometimes I would leave the house hungry. I would cook, but then immediately put the pan in the sink to soak before I left for the day. By the time I got home, I was dead tired and really did not feel like cleaning. So the cycle continued. I get up the next morning and I would have to clean my pan before I used it, or just not eat. The worst part, this was a Teflon pan. It was supposed to be nonstick! Sure, I’m taking a risk by having this pan in my home when it is known to give off toxic fumes, but what was I supposed to do? Soak and scrub stainless steel? Even though Teflon is “nonstick”, it would still stick! Plus I was super worried about health issues! It was a lose lose situation. Then this Cookware changed my life. I was looking for a new job, so I answered an ad that was looking for people to do live cooking shows. I thought this would be a pretty cool job, so I went for it. As it turned out, they were selling a new type of non-stick cookware. So right away, my inner skeptic came out. 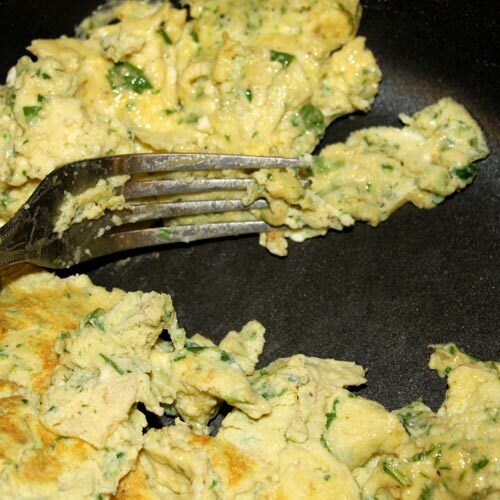 I was already aggravated with my non stick cookware at home and had done a bunch of research on Teflon. I knew there was one distinct chemical component in Teflon that was responsible for the harmful toxins. It’s called PFOA. A company called DuPont makes Teflon. They use PFOA, also known as C8, when manufacturing Teflon/nonstick cookware. If you’re not familiar with this chemical, you can watch the video below and see just how dangerous it is. I knew I definitely did not want to sell something that contained this chemical. So I figured instead of asking if this new cookware they were showing me contained Teflon, I be slick and ask if it contained PFOA (C8) directly. This is where I got completely floored. me this sticker . . . That’s right, no PFOA in these pans! They even made a point to print it on a sticker and slap it on the pan! OK OK great. It doesn’t have harmful toxins like Teflon does. But would it would be as nonstick? Then I watched the demonstration and I couldn’t believe what I saw. The guy literally put an egg in a pan with no butter or oil, cooked it, help and up, and the egg just fell out from gravity. It was crazy! I thought it was a trick. It had to be. How can you cook an egg with no oil and it just falls out? No way! So then they started teaching me the demo, I was waiting for the trick, the gimmick, the slight of hand. But it never came. They just said, “Okay now put the egg in the pan, let it cook for a sec, and then hold the pan up and blow it out”. That’s when he told me it was made with Titanium. Freaking Titanium! He explained that Teflon uses a chemical reaction in order to become non-stick (PFOA/C8). Titanium Cookware uses metals to create a non-stick surface, not chemicals. The metal reaction is the relationship between 99.9% titanium, a very small amount of ceramic. 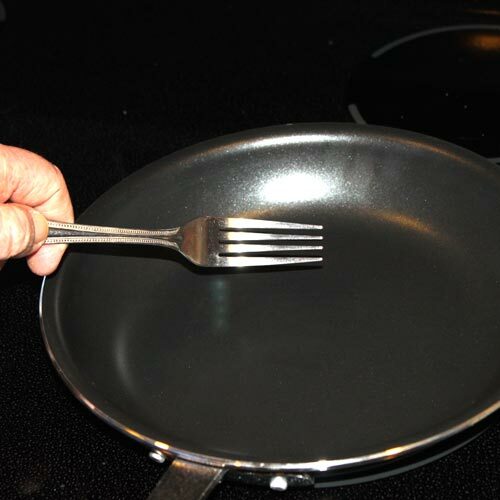 This metal reaction results in a pan that is 10 times more nonstick Teflon! You can watch the video below to see just how crazy nonstick Titanium Cookware is over Teflon. This is actually a recorded video from a live demonstration at a tradeshow. Long story short, I went on to become of the top salesmen for this cookware. Why? I mean after all, I wasn’t that great of a salesman! The real reason I did so well . . . it was the first product I ever sold, that I truly believed in. Before I go into what this cookware can do for you, I’d like to set the stage by debunking some myths about nonstick cookware and Teflon. There is a ton of misinformation out there, and you deserve to know the truth. Myth #1: Teflon is always toxic to cook with. This is not entirely true. Most cookware companies will tell you this in an attempt to sell cookware that isn’t nonstick at all. I’d like to be realistic with you instead. Teflon contains a chemical known as PFOA (C8). This is confirmed by DuPont, the company that make Teflon. PFOA has been used in industrial manufacturing since the 1950s. 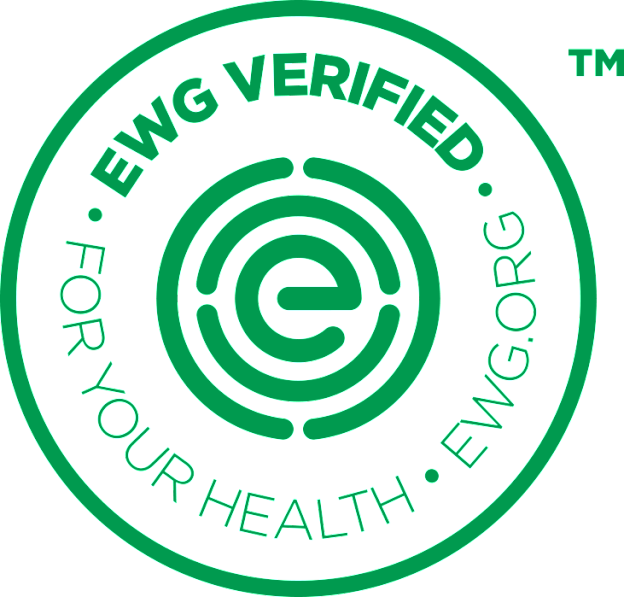 The EWG refers to PFOA as an “indestructible” chemical – which means that it never breaks down in the environment. Every molecule of PFOA that has ever been produced is still in our air, our water, and our bodies. 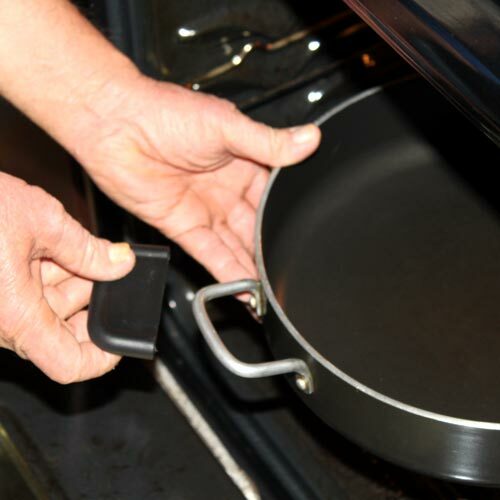 IF activated, PFOA ends up in your blood when you use nonstick pans, and it remains there for as long as you live. More exposure you have, the higher the risk of health issues you have, like cancer. But what activates it? Bottom line is, if you put a Teflon pan on the stove on low heat, PFOA will not be activated and you should not be exposed. However, once you reach 680°F, it’s a different story. This is where the danger comes into play. In new tests conducted by a university food safety professor, a generic non-stick frying pan preheated on a conventional, electric stovetop burner reached 736°F in three minutes and 20 seconds. At 680°F Teflon pans release at least six toxic gases, including two carcinogens, two global pollutants, and MFA, a chemical lethal to humans at low doses. Here is something truly hilarious. DuPont argues that a Teflon pan will never reach 680°, because you will never need to get that pan that hot to cook food. Therefore, it safe to use. So I decided to put this claim To the test myself. I went to Walmart and bought a cheap Teflon pan. I put it on the stove for just a couple of minutes to see what temperature it would reach and how quickly. Watch the video below to see why DuPont’s claim is completely false. So if we can’t use Teflon pans on high or even medium high heat, then what good are they? You don’t have to worry about how hot your pan gets when using Titanium Cookware. Why? Simple. Titanium Cookware does not contain PFOA. It just doesn’t. Titanium is one of the safest materials on the planet, it is even used in medical applications for replacing bones in the human body. Myth #2: Aluminum is bad for you, so you should avoid it. This is another mess I would like to address with some clarification. First let me be clear that our cookware is not 100% titanium. There’s no such thing as 100% Titanium Cookware, because titanium itself is not a good conductor of heat. You would have hotspots in the pan and it would not cook evenly if it was pure titanium. So in order to create an even cooking surface, we use an aluminum plate on the bottom of the pan to disperse the heat evenly into the titanium surface. The titanium surface is permanently fused to the aluminum plate. It’s not sprayed glue or baked on, so there is no chance that the aluminum would leach into your food. You would literally have to turn the pan over and cook on the bottom for that to happen, and I don’t think you’ll be doing that! Myth #3: You should never use Metal utensils. While this is completely true for Teflon and most nonstick cookware, it is not true for Titanium Cookware. The titanium surface of the pan will withstand normal use of ordinary metal utensils. Now this doesn’t mean you can grab a steak knife and start carving into the pan. You will of course leave a mark, that’s just common sense! Using metal spatulas should not affect the cooking surface of our Titanium Cookware, however knives and forks may dull the shine/finish. However, that would even happen with stainless steel cookware. Sometimes people look at the price of a quality product and say, “Hey, that’s great, but it’s too expensive!”. Let’s take cookware for instance. Sure, you could go to Walmart and buy a $20 Teflon pan, use it for a few months, and then buy a new one when it wears out. But if you think about it, you’ll end up spending far more money that way, buying new pans over and over. Not to mention, your time is worth money. Soaking and scrubbing and takes time. That’s time you could be spending with your family. So when you look at the cost of buying cheap cookware, you may find that it’s actually more expensive than spending the money on a quality product. Especially if that quality product will save you time they could be better spent with your loved ones. We used the approach of “Metals over Chemicals”. This means we use a metal reaction to create a surface that is 10x more nonstick than Teflon, which uses a chemical reaction. Chemicals fade and breakdown, metals do not. Are cookware is so nonstick, you can even cook food was absolutely no oil or butter. The Titanium surface is is not sprayed, glued, or baked on. It’s permanently fused to the aluminum cooking plate on the bottom so that it never chips, cracks, peels or flakes. This is covered under our 30 year warranty, so if it were to happen, we send you a new pan! Our Titanium Cookware is oven safe up to 500 degrees so that you can bake, braise, broil, sear, poach, brown or blacken in any of these titanium pans. Our cookware is rugged, made to industrial standards so that normal use with metal spatulas will not affect the cooking surface or performance. There is no Teflon or PFOA in this cookware so that you can sleep at night knowing this harmful chemical is not affecting your family or loved ones. The metal handles are made of industrial steel and triple-riveted so that they won’t come loose or break off like most store-bought cookware. Every Titanium pan is Certified by the NSF, The National Sanitation Foundation so that you are allowed to use it for commercial use. All of the lids are heavy duty stainless steel and have an adjustable steam vent built right in. Each lid is recessed about a half inch, creating a reservoir so that any liquid that may boil over will not create a mess. 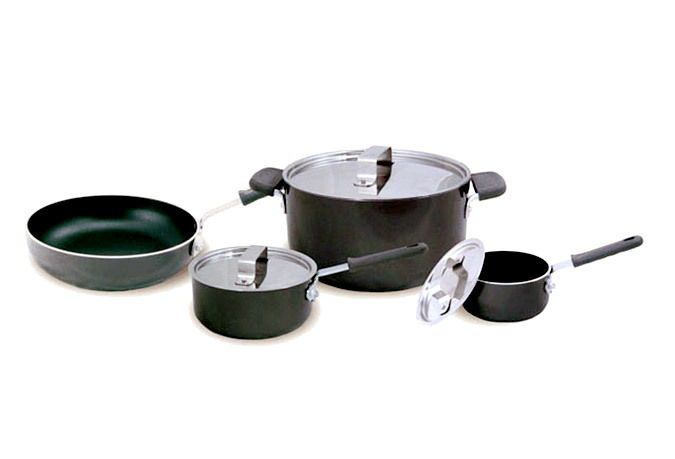 When you purchase a set of Titanium Cookware, here is what you get. The normal price we sell this set for at trade shows is $799. But today you’ll pay less than 1/2 of that total price. Because you can get a set of this amazing cookware today for the low price of . . . If they ever chip, peel, crack or flake . . . we send you a new one! If the handles come loose, or jiggle . 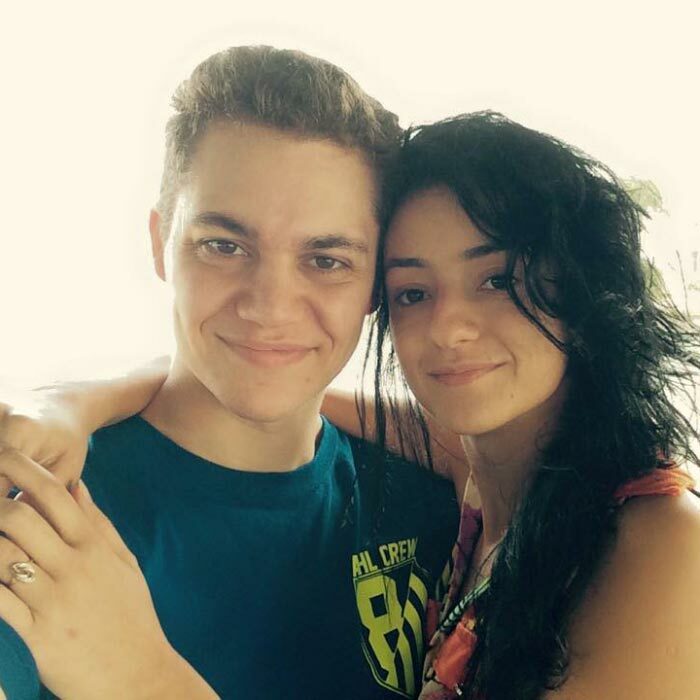 . . we send you a new one! 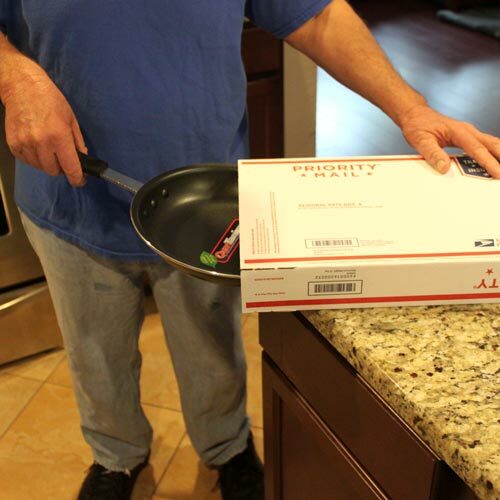 Additionally, once you receive your shipment of cookware, if you open the box and it wasn’t what you expected, you can simply return it for a full refund. 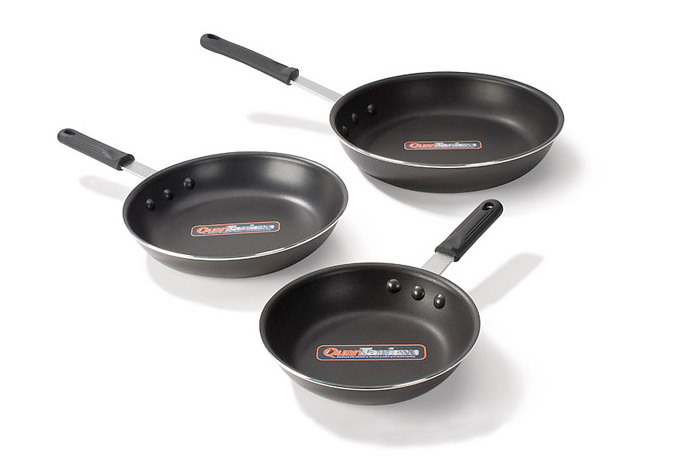 HOW LONG HAVE YOU BEEN TRYING TO FIND TRULY NON-STICK COOKWARE, WITHOUT HARMFUL CHEMICALS? I’m sure it’s been quite a while. What makes you think buying another Teflon pan is the answer? It wasn’t the answer before, and it won’t be the answer now. The answer is moving from cookware that is based on chemicals, to cookware that is based on metals. Metal is the answer. Sure, you could use stainless steel and avoid the chemicals, but then you are still living in a world where soaking and scrubbing is a daily struggle. Titanium gives you the best of both worlds. You’re getting a truly nonstick cookware that is 10x more nonstick than Teflon. Yet, your are NOT getting the harmful chemicals found in Teflon! 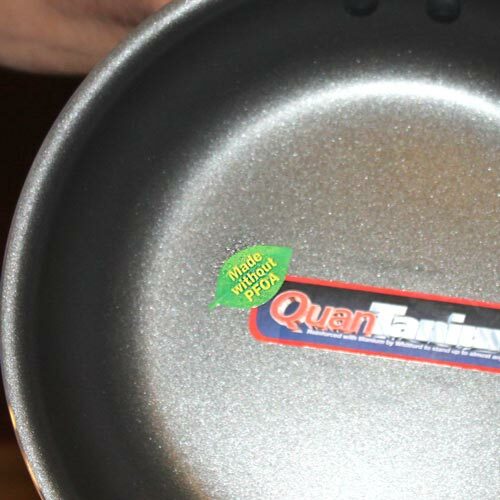 Once again, Titanium Cookware is PFOA free! 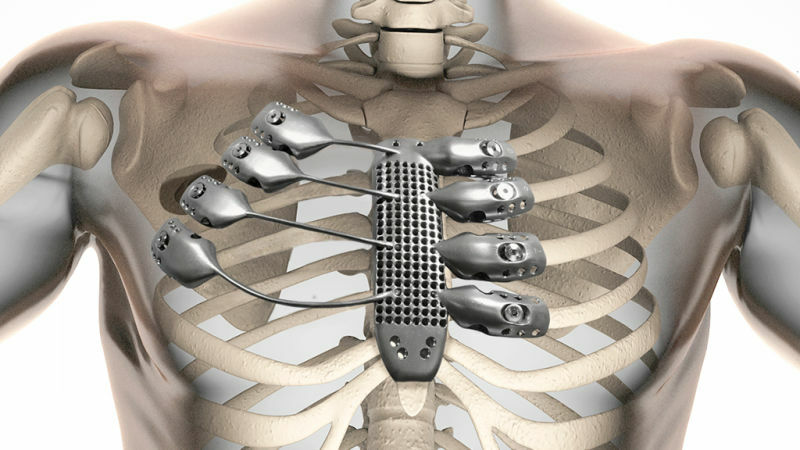 Titanium is so safe, it’s used in heart valve, knee and joint replacements. So my question is this. Are you holding yourself accountable? When you go to sleep at night and think about your health, are you doing something about it? When you stare at that pan soaking in the sink and feel the frustration build inside your body, who’s fault is it really? I know this may sound a little harsh, but it’s easy to tell ourselves we’ll change, but we often don’t. If you think it’s time for new cookware, then do something about it. Buy a set of Titanium Cookware and enjoy a world where “food sticking” isn’t a problem, nor is worrying about your health.